Christine Biehler creates site-specific works incorporating installation and actions. Since 20 years she has presented work at alternative spaces, galleries, museums and universities in Europe. The center of her artistic work is the transformation of space. Her installations are created in situ and refer to the given characteristics of a type of space. Ab initio they are intended to be a temporary “play. 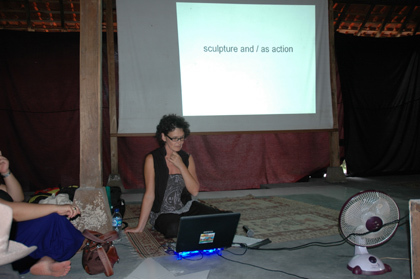 The installations conserve the process of action as well as material changes; sculpture gains a temporal dimension which becomes apparent in the use of performative elements with new media, immaterial techniques like video, light, sound, reflection, foam and vapour.